Bring casual style into your living room with the addition of this chair. Flare tapered arms perfectly match the flared seat back design, while tapered wood legs support the frame of this piece. A thick box cushion will leave you feeling relaxed, so you can enjoy your weekends at home. 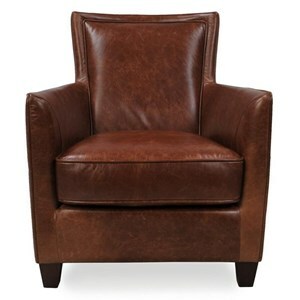 The 10064 Casual Chair with Flare Tapered Arms by Futura Leather at Sadler's Home Furnishings in the Anchorage, Fairbanks, Sterling, Alaska area. Product availability may vary. Contact us for the most current availability on this product.